I realize that there are some wounds that a lot of dog families are not willing to take care of at home. If it is the middle of the night, however, and you do not have access to an emergency vet, if the roads are iced over and you cannot travel, or if you are without a car and there is no one available, are you willing to just let your dog suffer? I would not be willing to. If you are not, find out what to do. Grab Your First Aid Kit! In order to treat any cuts or small wounds that your dog might get the kit should include some sterile bandages, some tape, a small bottle of hydrogen peroxide and another of betadine or chlorhexidine, disinfecting solutions that will clean any wound. If you already have a good first aid kit for people at home you can use that but you should also have elastic wrapping that he will not tear off and a pair of bandage scissors used with dogs. These scissors will not allow you to damage your dog when he wiggles around as you are bandaging his wound. Buy them at your local pharmacy when you are purchasing betadine. 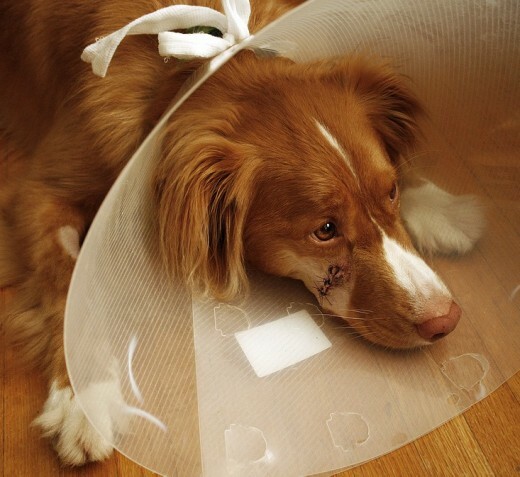 Even a dog that would not normally bite will be upset and may bite during wound cleaning. If you do not have your muzzle yet look at the video below and apply the next best thing before starting. Try to stop the bleeding by applying pressure. Put something on top of the wound and put pressure on it to allow the small vessels to clot and stop seeping blood. If the wound is small you can use a gauze square but if it is large just grab a clean towel. The wound is not clean yet and it is not a big deal if you use something from around the house. Stop more serious bleeding. If the bleeding from your dog´s wound is really bad, there might be a "pumper", and blood will shoot out every time his heart beats. This is common if the wound is deep, like a cut foot. It will do no good to apply pressure to this wound since it will still bleed. Go into your first aid kit and grab a pair of forceps, reach down into the wound and grab the tip of the vessel and clamp it shut. This is not easy, but keep trying. 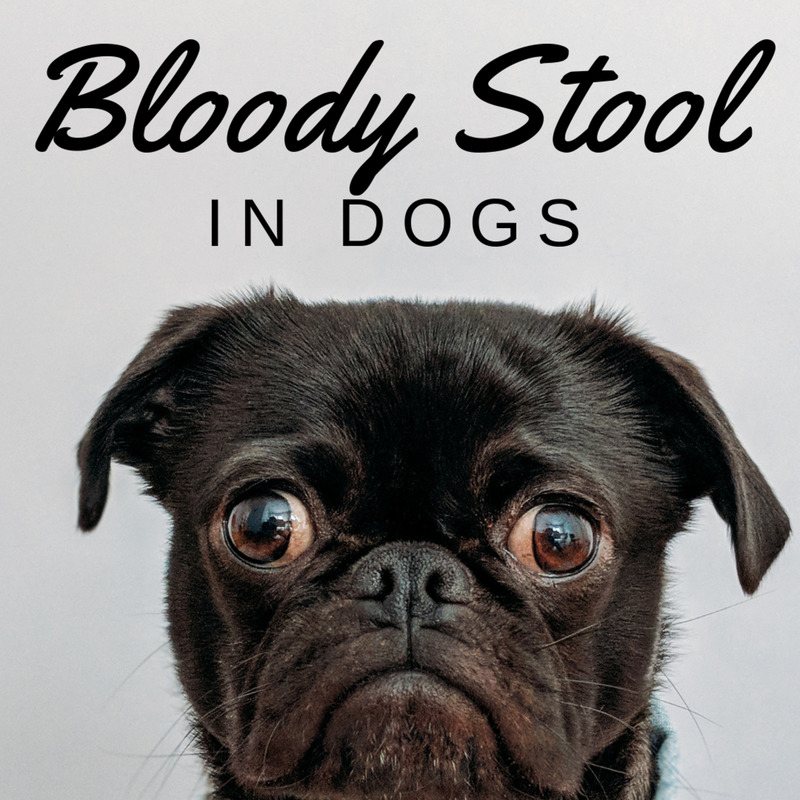 If you are not able to stop the bleeding the dog might bleed out and die. If the bleeder will not stop and you cannot clamp it you will have to do whatever you can to get him to a veterinary emergency clinic. Clean the wound. A bite wound can be quite small but since a tooth "injects" bacteria under the skin it will be dirty and infected. “Road rash” will be a lot larger and may look worse but is actually a lot cleaner. You can use the betadine from your first aid kit to clean around the wound but to actually clean it you can use plain tap water. (Use the large syringe in your first aid kit. Fill it up with water and spray the wound to flush it any bacteria.) Tap water is less irritating than most of the things we used to pour into the wound. If there is any gravel, twigs, or other material in the wound now is the time to take them out. Disinfect the wound. Your first aid kit should include some dilute betadine or a mild chlorhexidine that you can use to clean wounds. Never clean a dogs wound with hydrogen peroxide. It will damage the tissue and cause his wound to heal even slower. Apply a temporary bandage. This is not a regular bandage with tape and a roll of elastic. A gauze square will work fine on most wounds. Put a small amount of KY to top of the wound to keep any hair from falling in and then just put your temporary bandage on top of it. You do not need to tape up the wound or wrap the foot at this point. Just cover it up so it will not get even dirtier as you are working around it. Clip the hair around the wound. This is really important to help keep the wound clean. Use your scissors (be careful!) to clip the long hair around the wound and collect the hair so it doesn’t get the wound dirty. Wash your hands to remove all of the hair before finishing. Remove the temporary bandage, clean off the lubricant, and clean it again if you need to. As long as the wound is clean at this point, you can go ahead and finish. Clean open wounds again. Open wounds are more likely to become infected. If the wound is still open clean it again with some water and use a gauze pad to gently scrub the tissue before disinfecting. Apply a thin layer of antibiotic ointment. You should have a small tube in your first aid kit. This layer should be thin, just enough to keep more bacteria from entering the wound. Cover it up immediately so that the dog does not just lick it off. Put on a final bandage. 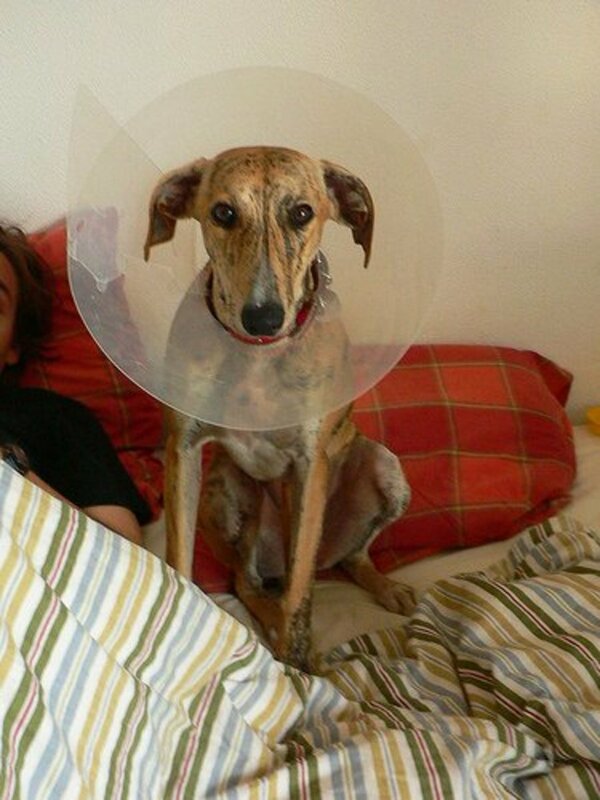 If the cut is on your dog´s side or back, a square bandage will do. If it is on one of the limbs you can put on a square bandage and then put an elastic bandage on top to hold it in place. If you do use a roll bandage on the limbs you need to make sure the toes are visible when you are finished. The toes on a normal dog are parallel and close together. Check the foot every hour to make sure that the toes look exactly the same as when you started (compare the toes to the foot that is not bandaged if you need to remember what normal looks like). If there is any swelling you need to take the bandage off and wrap it a lot looser. If you do not you can cause your dog to lose his leg. If you have done a good job cleaning the wound your dog might be okay with simple first aid. A small cut will be healed up within about a week, but if it is a larger case of road rash expect it to take longer. Will My Dog Need Anitbiotics and Pain Meds? Wounds that are very dirty (like a bite wound) will probably need antibiotics if not flushed immediately. If the wound needs to be sutured, or it is a large open wound that will become infected, take her into your veterinarian as soon as possible to start antibiotic therapy. If the wound is severely inflamed or is swollen with pus, your dog has an infection and should be put on antibiotics. Take him in to see your regular vet at that time. 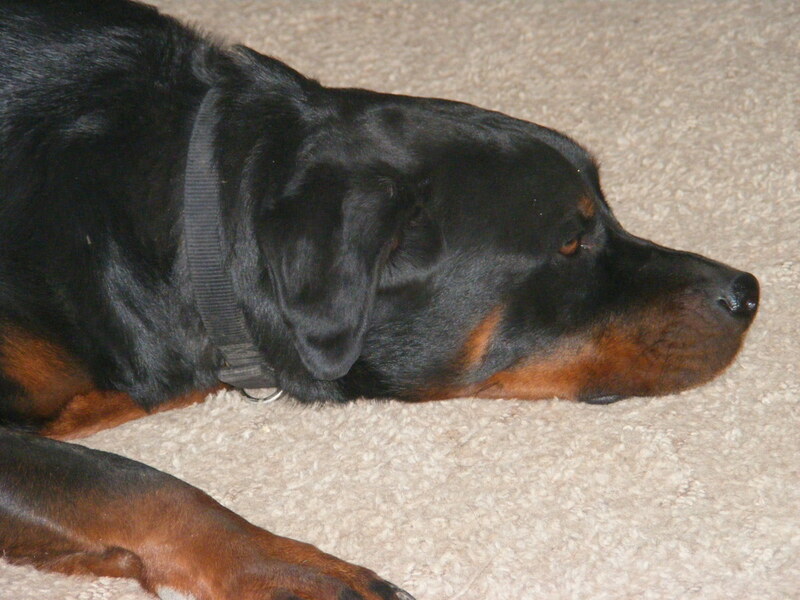 Your vet will also need to determine if your dog needs pain meds, based on the severity of the wound. Should My Dog's Wound Be Closed or Left Open? A small simple wound may be closed after cleaning. Small wounds that are sutured heal quickly and produce very little scar tissue. If you have cleaned up your dogs wound well, you can try to appose the edges and apply a bandage that will allow it to close and heal even quicker. Some wounds, especially on tissue like that of the nose and footpad, cannot be closed with sutures and are sealed with a surgical adhesive that is similar to super glue. If your dog has jumped through a glass window and has numerous small wounds that are bleeding, closing them after cleaning is sometimes the best alternative, but if you can apply some pressure and bandage the wounds it is better. As super glue is working it gets hot and really hurts; don’t be surprised if he tries to get away or bite. Only do this if absolutely necessary. Do not use this super glue technique on a bite wound. Bite wounds are dirty and you will be trapping the bacteria and it will cause an abscess; no matter how bad it looks it must heal from the inside/out. Do not use super glue to close wounds after road rash, do not use it on lacerations that are dirty, do not use it if there is any chance the wound might be infected. These wounds should be left open. When you are finished there will be a mess. Hydrogen peroxide breaks up the red blood cells and makes cleaning up a lot easier. Your dog will probably do best to remove any bandage. Most pet superstores sell plastic collars that will keep your dog from reaching his bandage. If you are not able to bandage your dog´s wound, an Elizabethan collar will also prevent your dog from licking on the wound. Dog saliva will not make a wound heal faster. 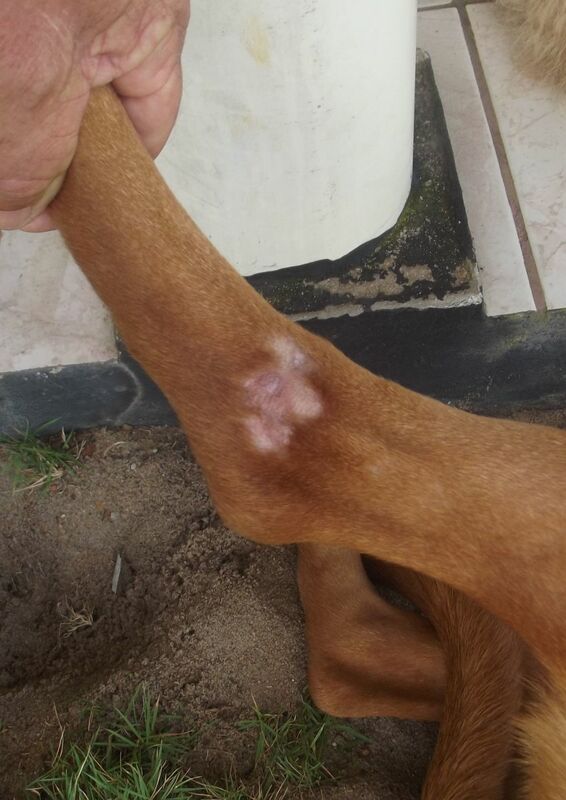 Check the wound daily to make sure that it is not infected or in need of further treatment. Your dog will appreciate your efforts. My dog has bite punctures on his legs. I tried to pick him up so I could clean them, but he growled and tried to bite me. One of the punctures is very deep. I don’t have the money for an emergency vet check. What can I do? Bite wounds are very dirty. The wounds will need to be cleaned thoroughly. 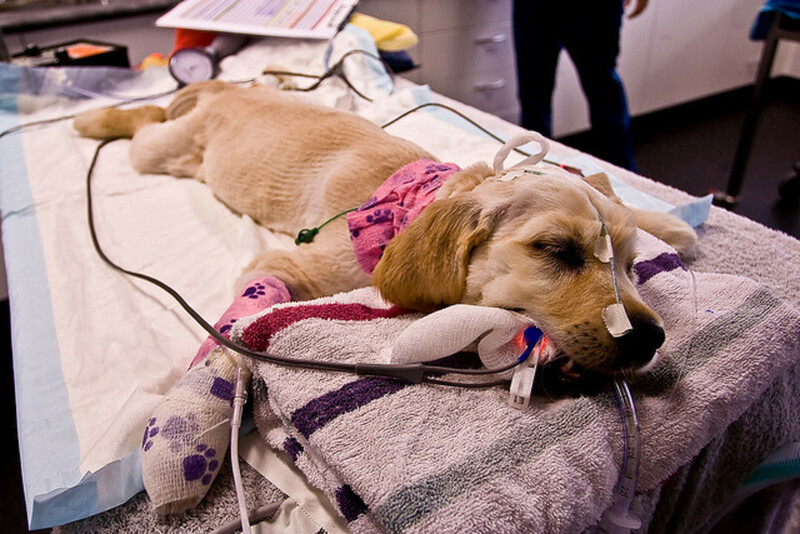 The vet will sedate your dog, put a muzzle on him so that he cannot bite, and then flush each wound before putting your dog on antibiotics. If you cannot take your dog to a vet the only thing you can do is to clean each wound with povidone iodine. You will need to muzzle your dog first. If you cannot muzzle him so that you do not get bit, there is not another option. My dog has a deep cut in his skin. It didn’t hurt the muscle, and it’s a centimeter wide. What is the best treatment for this? 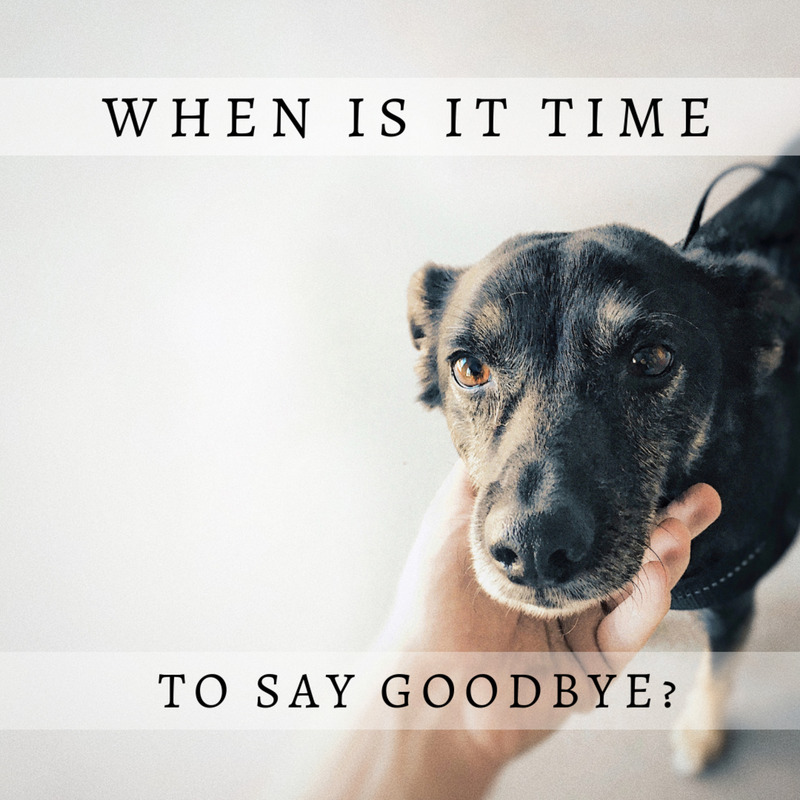 The best thing you can do for a deep cut, even if it does not sever any muscles, is take your dog to your regular vet and have the skin closed with sutures. My miniature pincher had a small growth on his shoulder, I noticed it was gone but there is an oozing hole there now. Can I put cortisone cream on it? The reason I do not put cortisone cream on a dogs wound is that they lick it. Those creams are not meant to be consumed. A much better thing to do is to clean it with povidone iodine. I also treat most small wounds with coconut oil to increase healing time. My dog has been knuckling, and has worn a hole into his foot above the toe, and has gotten it infected. What can I do? I'm on a fixed income, and cannot afford vet bills now that I am disabled. Cleaning it up should be no problem. You can use a mild product like povidone iodine. I do not recommend you put any antibiotic cream on the spot since dogs usually just lick it off, but if it is still inflamed some virgin coconut oil might help. 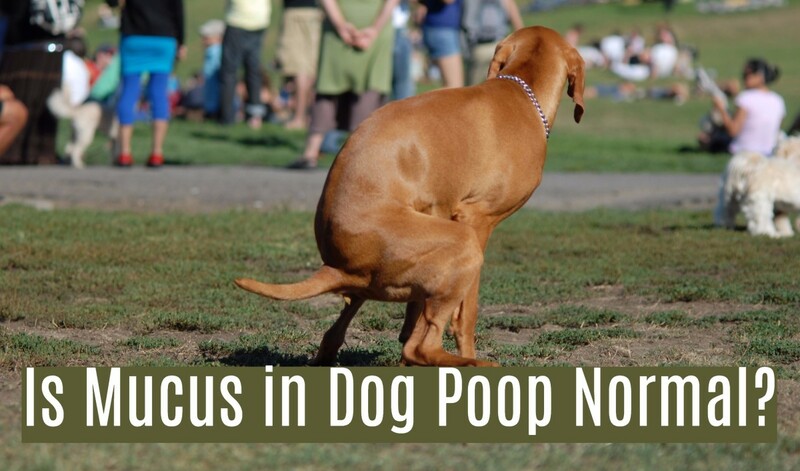 If your dog is knuckling over though, he may have a neurological problem or be suffering from an orthopedic disease. I realize it is going to be difficult to get him in for an exam, but you need to try to get him to your regular vet for an exam as soon as you can. My dog has two wounds around the neck, how should I clean them? It depends if they are scratches, deep lacerations, bite wounds, etc. If they are bites, they should just be cleaned and left open to heal by secondary intention. If the wound is deep, like a laceration from a knife, it can be cleaned up as described in the article, but will need to be sutured closed by your regular vet. My dog has a small puncture wound. I cleaned it and put on antibiotic cream. Will my dog be ok without going to a vet? 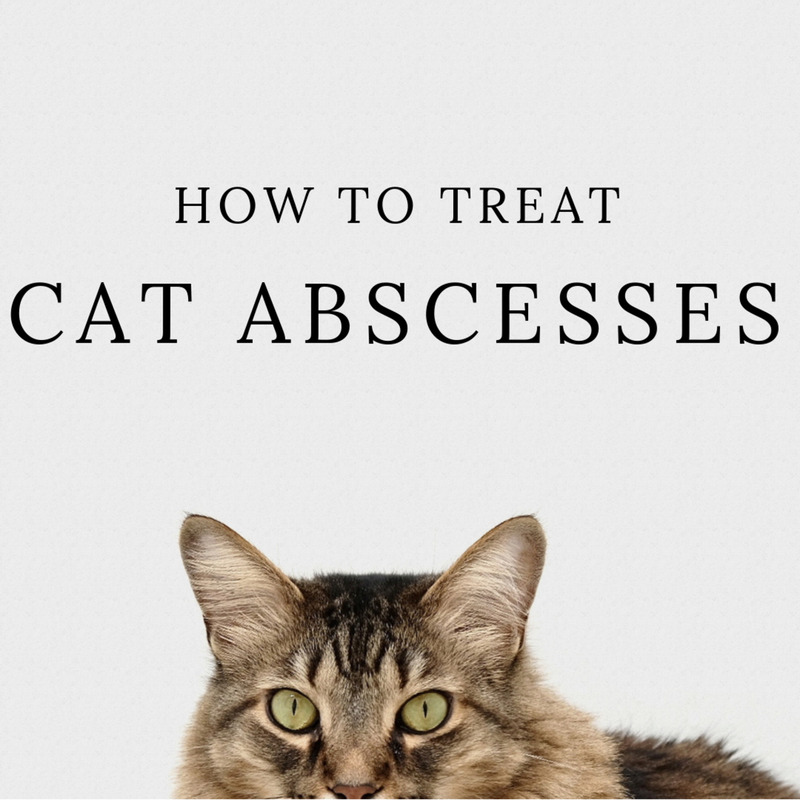 A small puncture wound is usually fine if you cleaned up and left it open so that an abscess does not form. Keep an eye on it, but you should have nothing to worry about. If your dog has a large wound that requires stitches, however, he will need to be seen by the vet. Can I put super glue on my dog's bite wound if I clean it? I don’t have the money for a visit to the emergency vet. If you close the wound up with super glue, it will probably become infected and then break apart, leaving an even bigger wound. If you cannot take your dog to the emergency vet the best thing to do is to clean the wound and then leave it open to heal. This is called "healing by secondary intention." It is more likely to leave a scar, which is why people do not want their wounds to heal up that way, but dogs do not usually care about scars, so that might be the best option. My dog had surgery and was licking the wound. Instead of putting a cone on, I bought a band-aid type bandage and put it on her thinking it would help. I didn’t realize how sticky it would be, and I can’t get it off without seriously hurting her. Is there anything I can use to help with the removal? Or will it fall off by itself in time? It will eventually fall off, but the wound underneath the bandage can be pretty severely infected by that time. When someone brings in a dog with a stuck bandage, I usually moisten it with hydrogen peroxide. You can also use betadine as it is less stressful if the dog has an open wound. Do not use alcohol. It will sting, and your dog might get upset and bite. My dog was hit by a car, and she has a scrape on her head above her eye that looks like road rash. It's not deep, but I'm really worried but can't make it to the vet. What should I do? Road rash cannot be closed up, so the best thing you can do is clean it up. Use povidone iodine or chlorhexidine, make a lather as you scrub and clean with plenty of water. Be careful! This hurts, and some dogs will bite. Even if you cannot make it to the vet at this time, take her in as soon as possible for a thorough physical exam. My dog jumped into a lake when he got loose. Unfortunately, there were branches so I couldn't jump in to get him. He eventually got out but he had a cut on his head. He's not bleeding but has blood on the wound. Do I have to worry? It is impossible for me to judge how deep the wound is over the internet. I would recommend following the directions in the article. If you clean the wound and it is deep you may need to take him to your regular veterinarian. It does not sound like an emergency so please do not worry. My dog lost a toenail that got caught up while playing with a neighbor. Will the nail grow back? We cleaned the area with water, stopped the bleeding, placed a small amount of bacitracin in the area and used sterile gauze to bandage it. Is this sufficient? You did a good job cleaning it up, but you should still monitor it for the next few weeks and treat it if it becomes infected. You can use an over-the-counter iodine solution (that you can purchase at a neighborhood drug store) to keep it clean. Yes, the nail will grow back. Just keep it from becoming infected in the meantime. Can I use NewSkin on my dog? As it sets it tends to burn. If your dog is very mild it can be used in place of sutures but you may end up getting bitten. The problem with sutures is secodary infections. If the wound is not very clean, the bacteria multiply, the wound breaks open, and you are dealing with a problem even worse than before. It is often better to let a small wound stay open and heal naturally. Kathy, can you call the vet that did the surgery? He or she may want to see your dog. That is best. If you cannot, just keep your dog from licking and chewing the incision and making it worse. An elizabethan collar (a cone) is best. You can get one from a pet store. If there is something sticking out, you will need to take him to an emergency vet to have it sutured. Jen, I do not understand your comment about not being able to take your dog to the vet because he is big. Your regular vet might want to look into his weight loss. If the skin is just peeling, that is nothing to worry about. if it is coming off and exposing the tissue underneath, that indicates a deep infection. He will need to be on antibiotics if that is the case. Mike, if your dog is walking fine it could just be scar tissue, which does appear grayish. If he is limping he should see your regular vet. Norma, this is not something to do at home. Contact the vet that did the surgery immediately. My dog cut his paw pad and it was healing fine but now it's starting i turn gray. Is that normal? Hi Mark, you did not mention if the opening was very large or small. It is very hard to blame the emergency vet because they usually have to close a wound as fast as possible and staples are a lot faster. Your regular vets technique may have been better, but at this point you are talking about an old wound, and no suture may hold if the tissue is already friable. As I mentioned, I do not know how big this is. If it is small, I would just let it heal by secondary intention and plan on the dog having a scar there. If it is very large, the vet may try another suture technique to pull the subcutaneous tissue together, but do not be surprised if it falls apart again. All you can do is keep it clean, keep the dog from licking it and rubbing it on the carpet, and apply the medication as directed. My dog had a lump on her hip removed 12 days ago. 3 days later, the stitches tore thru and I took her to the emergency vet, who stapled her up. The following Monday, I took her to her regular vet who was very unhappy with the emergency Vet’s shoddy work. He had us bring her in the next morning to remove the staples and re-work the stitching. I took her in again yesterday because she had a bit of oozing, and they glued some of it again. This morning, her wound opened up again. I hesitate to take her to emergency again because of the not so good job they did last weekend. She is on clindamycin already, but I did go ahead and put a little curaseb (chlorhexidine and antifungal) on it, gently. Then I put some ointment (triple antibiotic with bacitracin etc). Her vet said to bring her in again Monday if it broke open again, and he’d try a spiderweb type of suture technique. Is there anything else you suggest in the meantime? Sarah, wounds on the pads can get pretty dirty so need to be cleaned several times a day, not closed up. If you cannot take her to the vet then keep on cleaning it and monitoring healing. If it is not closing, however, you may need to take her in. My dog is 6 months old she cut her paw pad on a piece of glass outside it’s down pretty deep and the cut is towards the edge of her pad but it stopped bleeding by the first day (two days ago) I’ve been cleaning it with cold water and a wound cleaner for dogs I got from oetsmart, I’ve been putting gauz pads and a self adhesive wrap everyday I repeat this Process I’m not in the position to take her to the vet but the wound seems to be looking okay, should I use clear skin glueand go ahead and glue it up or should I let it heal on it’s own and keep doing what I’m doing? You can get over this problem by applying an Elizabethan collar. If you do not, or are not able, to use on, contact your local vet. My dog is very hyper and had a minor scratch on his head. I clean the thing and apply ointment but he scratches it everytime and makes it worse. Doesnt let me tie protection collar or anything. Wound is becoming severe. Please advise i am worried. Great article on cleaning wounds. Our dog had a large lump on his neck and it was caused from a grass seed, It took the vets 4 hours as it was right on his jugular vein. I just rub some dirt in it. Thanks for great tips that we can have on hand should we ever need them. 6 years ago from Islamabad, Pakistan. The worst wound I encountered was hen my dog had a cancerous lump that old not heal. Great info, Thanks for the tips!